The Bhimbetka rock shelters are an archaeological site in central India that spans the prehistoric paleolithic and mesolithic periods, as well as the historic period. It exhibits the earliest traces of human life on the Indian subcontinent and evidence of Stone Age starting at the site in Acheulian times. It is located in the Raisen District in the Indian state of Madhya Pradesh about 45 kilometres (28 miles) southeast of Bhopal. It is a UNESCO world heritage site that consists of seven hills and over 750 rock shelters distributed over 10 kilometres (6.2 miles). At least some of the shelters were inhabited by Homo erectus more than 100,000 years ago. The rock shelters and caves provide evidence of, according to Encyclopædia Britannica, and a "rare glimpse" into human settlement and cultural evolution from hunter-gatherers, to agriculture, and expressions of spirituality. Some of the Bhimbetka rock shelters feature prehistoric cave paintings and the earliest are about 30,000 years old. 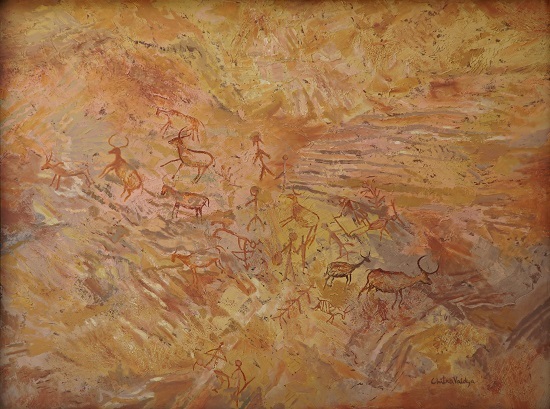 These cave paintings show themes such as animals, early evidence of dance and hunting. The Bhimbetka site has the oldest known rock art in the Indian subcontinent, as well as is one of the largest prehistoric complexes. The name Bhimbetka (भीमबेटका) is associated with Bhima, a hero-deity of the epic Mahabharata. The word Bhimbetka is said to derive from Bhimbaithka (भीमबैठका), meaning "sitting place of Bhima"
The Rock Shelters of Bhimbetaka (or Bhim Baithaka) is 45 kilometers southeast of Bhopal and 9 km from Obedullaganj city in the Raisen District of Madhya Pradesh at the southern edge of the Vindhya hills. South of these rock shelters are successive ranges of the Satpura hills. It is inside the Ratapani Wildlife Sanctuary, embedded in sandstone rocks, in the foothills of the Vindhya Range. The site consists of seven hills: Vinayaka, Bhonrawali, Bhimbetka, Lakha Juar (east and west), Jhondra and Muni Babaki Pahari. W. Kincaid, a British India era official, first mentioned Bhimbetka in a scholarly paper in 1888. He relied on the information he gathered from local adivasis (tribals) about Bhojpur lake in the area and referred to Bhimbetka as a Buddhist site. The first archaeologist to visit a few caves at the site and discover its prehistoric significance was V. S. Wakankar, who saw these rock formations and thought these were similar to those he had seen in Spain and France. He visited the area with a team of archaeologists and reported several prehistoric rock shelters in 1957. It was only in the 1970s that the scale and true significance of the Bhimbetka rock shelters was discovered and reported. Since then, more than 750 rock shelters have been identified. The Bhimbetka group contains 243 of these, while the Lakha Juar group nearby has 178 shelters. According to Archaeological Survey of India, the evidence suggests that there has been a continuous human settlement here from the Stone Age through the late Acheulian to the late Mesolithic until the 2nd-century BCE in these hills. This is based on excavations at the site, the discovered artifacts and wares, pigments in deposits, as well as the rock paintings. The site contains the world’s oldest stone walls and floors. Barkheda has been identified as the source of the raw materials used in some of the monoliths discovered at Bhimbetka. The site consisting of 1,892 hectares was declared as protected under Indian laws and came under the management of the Archaeological Survey of India in 1990. It was declared as a world heritage site by UNESCO in 2003. Of the numerous shelters, the Auditorium cave is one of the significant features of the site. Surrounded by quartzite towers which are visible from several kilometers distance, the Auditorium rock is the largest shelter at Bhimbetka. Robert Bednarik describes the prehistoric Auditorium cave as one with a "cathedral-like" atmosphere, with "its Gothic arches and soaring spaces". Its plan resembles a "right-angled cross" with four of its branches aligned to the four cardinal directions. The main entrance points to the east. At the end of this eastern passage, at the cave's entrance, is a boulder with a near-vertical panel that is distinctive, one visible from distance and all directions. In archaeology literature, this boulder has been dubbed as "Chief's Rock" or "King's Rock", though there is no evidence of any rituals or its role as such. The boulder with the Auditorium Cave is the central feature of the Bhimbetka, midst its 754 numbered shelters spread over few kilometers on either side, and nearly 500 locations where rock paintings can be found, states Bednarik. The rock shelters and caves of Bhimbetka have a large number of paintings. The oldest paintings are found to be 30,000 years old, but some of the geometric figures date to as recently as the medieval period. The colors used are vegetable colors which have endured through time because the drawings were generally made deep inside a niche or on inner walls. The drawings and paintings can be classified under seven different periods. Period II – (Mesolithic): Comparatively small in size the stylised figures in this group show linear decorations on the body. In addition to animals there are human figures and hunting scenes, giving a clear picture of the weapons they used: barbed spears, pointed sticks, bows and arrows. Some scenes are interpreted as depicting tribal war between three tribes symbolised by their animal totems. The depiction of communal dances, birds, musical instruments, mothers and children, pregnant women, men carrying dead animals, drinking and burials appear in rhythmic movement. Period III – (Chalcolithic) Similar to the paintings of the Mesolithic, these drawings reveal that during this period the cave dwellers of this area were in contact with the agricultural communities of the Malwa plains, exchanging goods with them. Period IV & V – (Early historic): The figures of this group have a schematic and decorative style and are painted mainly in red, white and yellow. The association is of riders, depiction of religious symbols, tunic-like dresses and the existence of scripts of different periods. The religious beliefs are represented by figures of yakshas, tree gods and magical sky chariots. Period VI & VII – (Medieval) : These paintings are geometric linear and more schematic, but they show degeneration and crudeness in their artistic style. The colors used by the cave dwellers were prepared by combining black manganese oxides, red hematite and charcoal. One rock, popularly referred to as “Zoo Rock”, depicts elephants, barasingha (swamp deer), bison and deer. Paintings on another rock show a peacock, a snake, a deer and the sun. On another rock, two elephants with tusks are painted. Hunting scenes with hunters carrying bows, arrows, swords and shields also find their place in the community of these pre-historic paintings. In one of the caves, a bison is shown in pursuit of a hunter while his two companions appear to stand helplessly nearby; in another, some horsemen are seen, along with archers. In one painting, a large wild boar is seen. 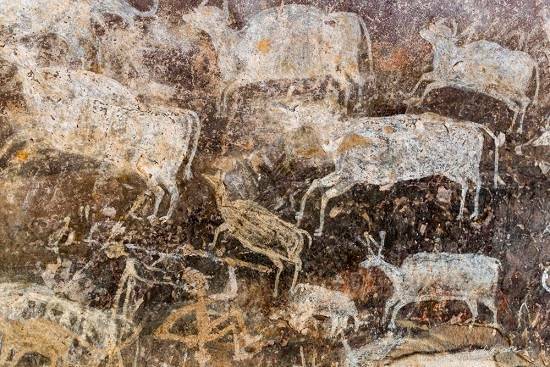 The paintings are classified largely in two groups, one as depiction of hunters and food gatherers, while other one as fighters, riding on horses and elephant carrying metal weapons. the first group of paintings dates to prehistoric times while second one dates to historic times. Most of the paintings from historic period depicts battles between the rulers carrying swords, spears, bows and arrows. In one of the desolate rock shelters, the painting of a man holding a trident-like staff and dancing has been named "Nataraj" by archaeologist V. S. Wakankar. It is estimated that paintings in at least 100 rockshelters might have been eroded away.